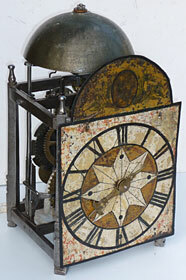 Charles II period lantern clock by ‘William Millin of Islington fecit’, who was working in the 1670s, re-converted balance wheel escapement, the only clock yet documented by this maker. SOLD. Italian Gothic iron chamber clock, seventeenth century. SOLD. Swedish Gothic iron chamber clock, seventeenth century. SOLD. 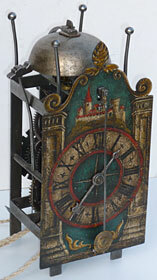 Swiss Gothic iron chamber clock, seventeenth century. SOLD. 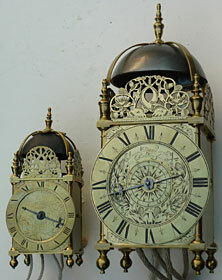 Two lantern clocks by Edward Norris of London, one standard size with original balance wheel escapement and one miniature also with balance wheel escapement, which is exceptionally rare for a miniature. SOLD. Amazing lantern clock with verge pendulum made almost entirely from WOOD, excluding the pinions (one lantern-type) and teeth of the verge wheel. Even the countwheel, hoop, spurs, hammer and hammer spring are of wood. From mainland Europe, probably the German Black Forest area copying the English style, date uncertain, probably nineteenth century. SOLD. An exceptionally small travelling wall clock of superb quality made about 1750 by Thomas Pott of St. James's Street, London, housed in a mahogany hood. See article. SOLD. 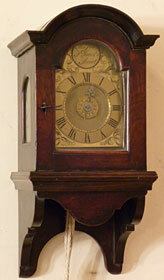 A fine late seventeenth century lantern clock by Joseph Curtis of Chew Magna originally with verge pendulum converted later to anchor and long pendulum. Pictured unrestored. SOLD.